My Jeep CJ Love Affair Began in 1985! All the goodies but the kitchen sink!! Bought new in 1985. First mod was 31 inch tires and rims..didn't take long to start adding more . Four inch lift soon followed with 33inch tires. Then I wanted more. The Jeep bug bit me hard! I decided I had to have, and really needed new gearing, so I switched to 4:56 ratio with ARB lockers!! Shackle reversal up front, and to even it out 1 inch larger shackles in back were then added. Swapped out the motor for a built 4.2L with mild cam, HEDMAN headers, HOLLEY pro jection throttle body fuel delivery, with cold air intake, and a BE COOL aluminum radiator. Added custom full roll cage, Hurst shifter, custom gauge panel, GRANT steering wheel, WARN 8000 lb winch, BULLET PROOF bumpers, TOM WOODS drive shaft, Custom steering linkage, and FLAMING RIVER steering shaft. ALL sitting on SUPER SWAMPER SSRs, with AMERICAN RACING aluminum rims. 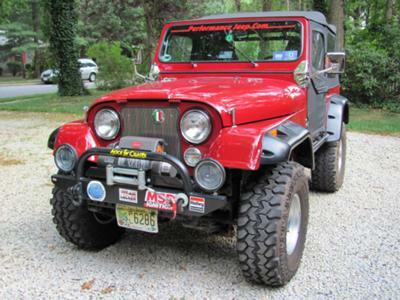 Comments for My Jeep CJ Love Affair Began in 1985! CJ-5....Now that's a real Jeep! Cool Ride! 1. what was the original engine on your '85 CJ5? 2. was it a v6 carburetor type or a TBI? 3. did you do most of the work yourself or did you take it to a certified mechanic/shop? 4. what a great looking Jeep!!!! approximate cost of all your total improvements if you don't mind? Thank you.